I don’t consider myself a fashionista. The last time I picked up a Vogue was when Jennifer Lawrence was on the cover and I wanted to see her gorgeous photos with the glossy shine of a magazine slick. I do, however, love to spruce up my wardrobe each fall. Maybe it’s residual excitement from back-to-school shopping, but I find myself adding a few chunky sweaters, a dark pair of jeans, and a few accessories to the mix every season. This year I will need to do a little more damage to our bottom line… I accidentally donated all my sweaters to Goodwill when getting rid of my chubby clothes. (Note to self: label everything!) Here are some of the items on my wishlist, along with what I consider to be fall’s best trends. Leather jacket (faux, of course). While robe coats were all over the runway this season, my go-to outerwear choice for the crisp fall months is a sleek faux leather jacket. The right one will look good with anything underneath it, from jeans and a flannel to a LBD. I love sleek styles, like this one from Wilsons Leather in black. Layers. When done right, this is my favorite fall look. Try a patterned oxford under a solid sweater or a chambray top and heavy tights under your favorite summer dress. It’s so fun to mix and match different patterns and styles! Scarves. The most versatile accessory a girl can have, in my opinion – have you seen this video with all the different ways to tie a scarf? I’m on the hunt for a great skull patterned scarf, like this one from Etsy. Chunky sweaters. It could be because I work from home, but I find myself drawn more to comfy clothes that are slightly too big and feature expanding waistlines. Thick, large-knit sweaters are definitely my bag. Boots. Tall, short, casual, dressy… doesn’t matter for this fall staple. I have my tall pair of brown and black boots that can easily be dressed up or down. I’ve had my eyes on these casual boots from Target. A nice pair of booties for professional trips would be great, too. Flannel + flashy necklace. Something new for me this year, and a trend that’s popping up on my Pinterest feed. 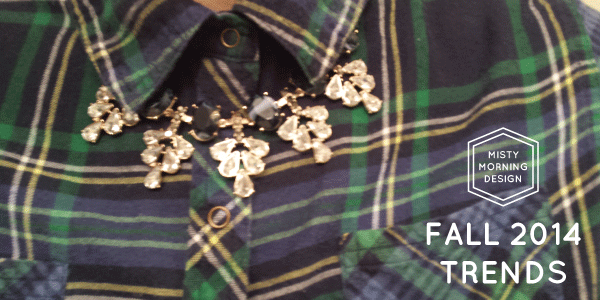 Pairing a fancy necklace with a more casual flannel top is a fun way to dress up for fall outings.